Avery Elle: Our Newest Guest Designer and Previews! Our Newest Guest Designer and Previews! Today is an exciting day here at Avery Elle. I have the pleasure of announcing our newest guest designer as well as show you some sets in our upcoming release this Thursday. Woot Woot! Our AEI♥U Challenge Winner is Katie Gehring. Congratulations! I love this clean, simple and pretty card. 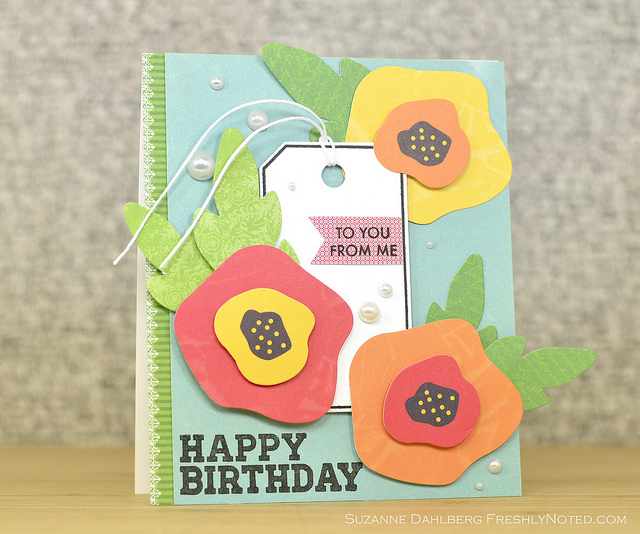 We are so fortunate to have you as a guest designer for September! Please contact us at customerservice@averyelle.com so that we can get your prize to you. A big thank you to all that entered our challenge this month. You are all so talented and we love seeing each and every project. If you weren't picked this time, please consider entering again in our next guest designer challenge that will start on Friday, August 16th. Last but not least, here some previews of our August/September release. All sets will be available for purchase this Thursday, August 8th. 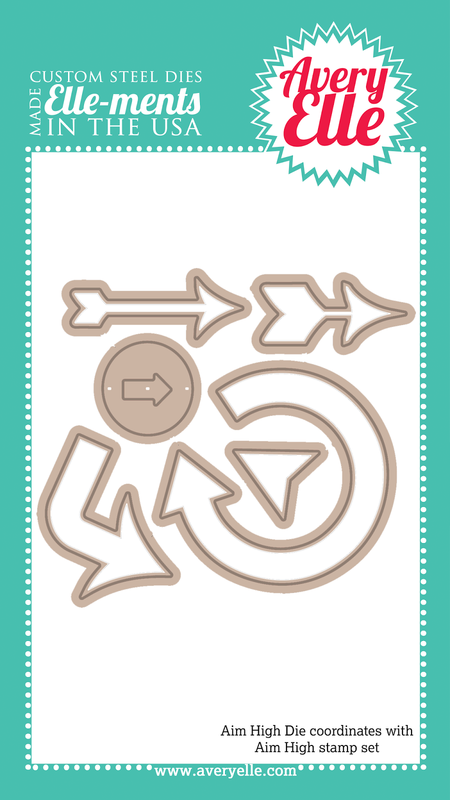 A while back, Chunyuan Wu requested an arrow die set. 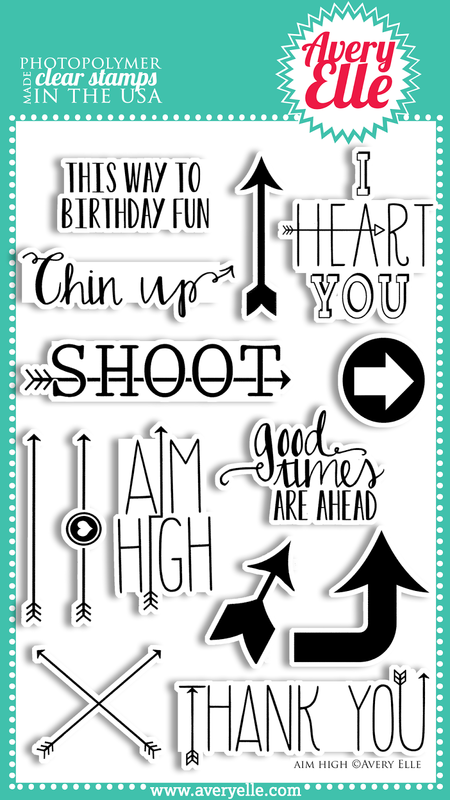 Our Aim High stamp set and coordinating die is a result of that request. 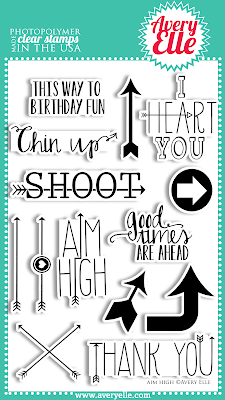 I really love all of the fun sentiments and arrow shapes included. Take a look for yourself. Our Aim High Elle-ments Custom Steel Die are exclusive to Avery Elle. These premium steel dies coordinate with our Aim High clear photopolymer stamp set and are proudly made in the USA. 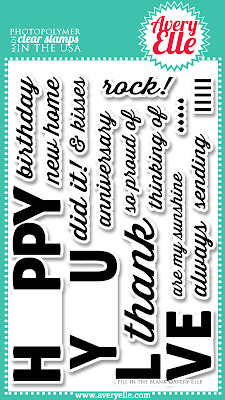 Use our 4" x 6" Fill In The Blank clear photopolymer stamp set for cards, project life, scrapbook pages and more. 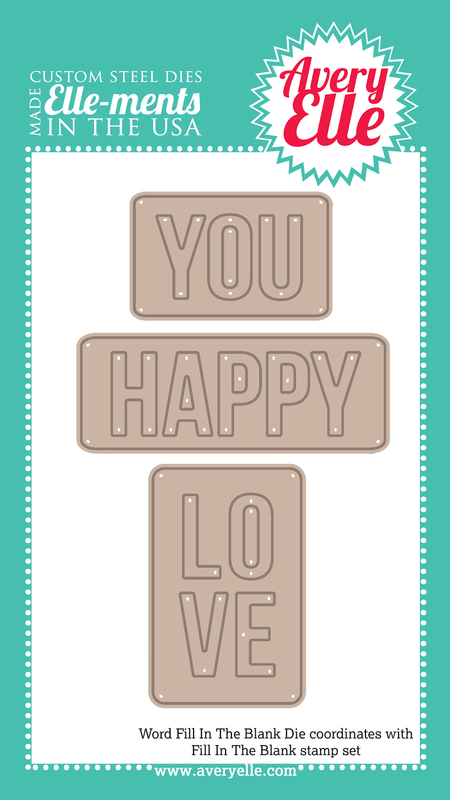 Use the coordinating Icon Fill In The Blank Elle-ments Dies to use images instead of vowels in the words Happy, You and Love. Use our coordinating Words Fill In The Blank Elle-ments dies with the smaller sentiments in this set to create even more looks. Designed by JJ Bolton. 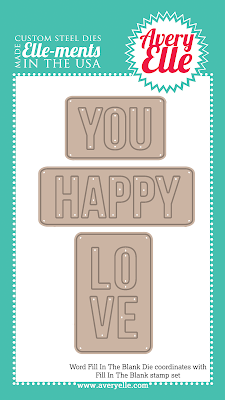 You Sentiment Measures: 2 1/5" x 9/10"; Happy Sentiment Measures: 3 3/5"x 9/10"; Thank Sentiment Measures: 2 1/4" x 3/5"
Our Icon Fill In The Blank Elle-ments Custom Steel Dies are exclusive to Avery Elle and are designed by JJ Bolton. These premium steel dies coordinate with our Fill In The Blank clear photopolymer stamp set and are proudly made in the USA. Icon dies measure from 3/4" diameter to 1" diameter. 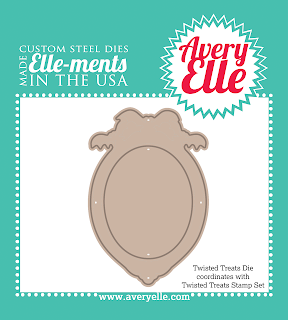 Our Words Fill In The Blank Elle-ments Custom Steel Dies are exclusive to Avery Elle and designed by JJ Bolton. These premium steel dies coordinate with our Fill In The Blank clear photopolymer stamp set and are proudly made in the USA. 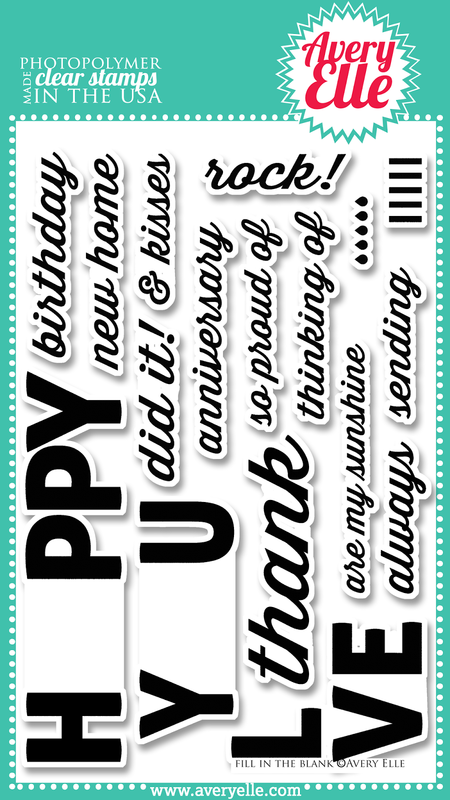 Use these dies with the smaller sentiments in our Fill In The Blank photopolymer stamp set to create fun greetings. Use the dies alone to spell additional words such as "Hello" "Have A Happy" "Love You" "Hola" "Holla" "YOLO" . 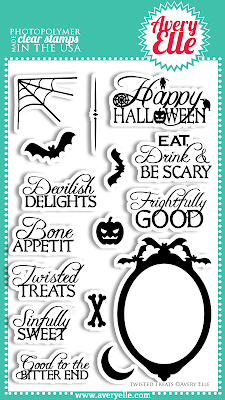 Happy Die measures: 2 3/4" 1"; Love Die measures: 1 3/10" x 2 1/10"; You Die measures: 1 3/4" x 1"
Our 4" x 6" Twisted Treats clear photopolymer stamp set is frightfully fun. 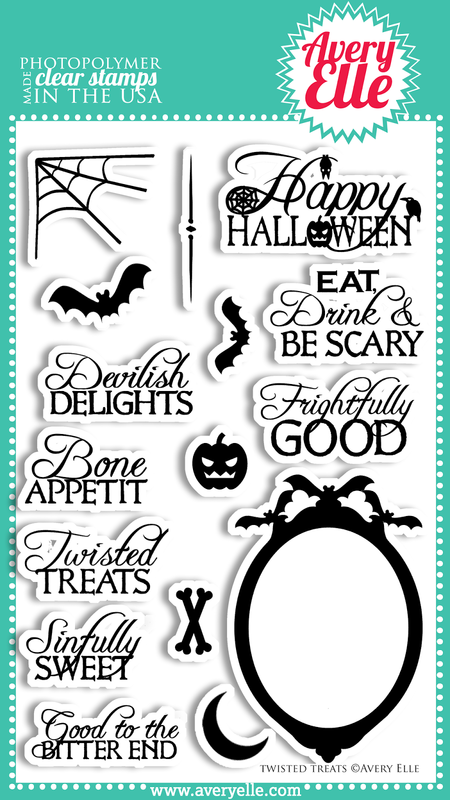 The sentiments and spooky sentiments in this set are perfect for parties, gift bags and more. Use them with the coordinating Twisted Treats Elle-ments Die to create professional results. 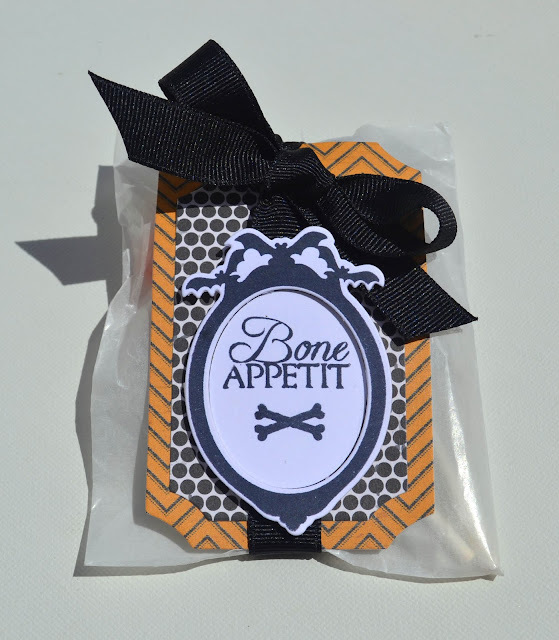 Happy Halloween sentiment measures: 1 3/4" x 9/10"; Pumpkin Image Measures: 1/2"x 1/2"; Spider Web Image Measures: 1 1/10" x 9/10"; Bat Frame Image Measures: 1 3/4" x 2 7/10"
Our Twisted Treats Elle-ments Custom Steel Dies are exclusive to Avery Elle. These premium steel dies coordinate with our Twisted Treats clear photopolymer stamp set and are proudly made in the USA. I created this little treat bag using our new Twisted Treats stamp set and die along with some patterned paper from Echo Park. I completed the look by adding a bit of New Moon Grosgrain Ribbon. I love this little bat frame SO MUCH! Thanks for stopping by to take a peek. Be sure to stop back tomorrow for more previews of our upcoming release. Have a great day! Wonderful new sets! I love Twisted Treats and Fill in the Blank. The icon dies are so perfect to go with the set. 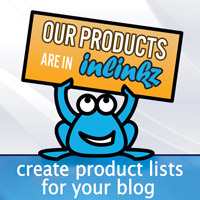 What a delightful 'sneak peek' of your new products! LOVE them alllll!! 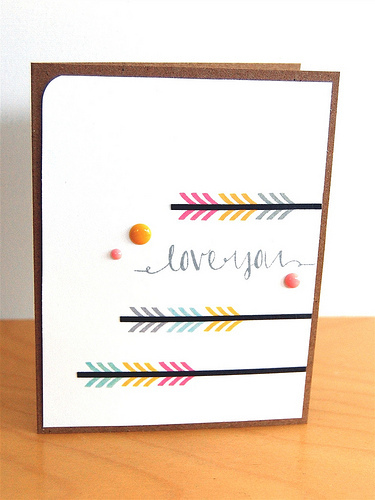 I am loving those arrow dies and the Fill In the Blank sets are such a fun idea! 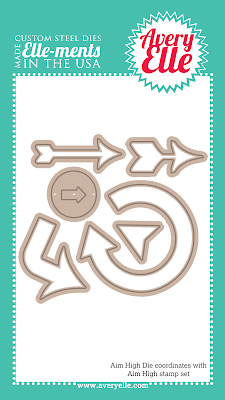 I am really loving the Icon Fill In The Blank Custom Steel Dies. I'm already thinking up tons of projects for those! Cute new stamps and dies! And congratulations to Katie! congrats katie! that is a gorgeous card! and im in love with the aim high set... cant wait! HUGE CONGRATS to Katie & for another FABULOUS release!!! These look like a ton of fun! This release seems to be packed with goodies! Can't wait to see more! fill in the blank is a must have! Love the new sets and dies...can't wait! Oh these new stamps are awesome! Super cute! Love all your new sets! FABulous news sets!!! Love the Fill in the blanks set!! Halloween set is so cute!!! Great new sets! Love the Halloween stamps. Oh, dear! My wish list just got about a mile long. 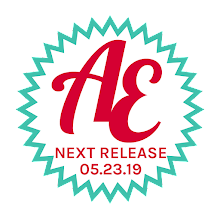 I'm not kidding when I say I want every single stamp set and every die you previewed So looking forward to this release! It Is Time For Our August/September Blog Hop! Inspiration with Nina and Donna! Our August AEI♥U Challenge Starts Today! A winner and a lot of inspiration!